In the course of my pursuit of the chocolate issue, I have learned a lot of facts that most people find very surprising. I have also begun to learn the basics of how you can avoid “slave chocolate,” and what some useful organizing tactics might be to raise awareness and make it easier for the average person to avoid it as well. For instance, most people assume that all the chocolate products sold at their co-op or their sustainable, conscientious grocer, such as Fresh Thyme, are fair trade. Most people assume that an organic certification is a guarantee of fair trade. The reason they think this is that about 20 years ago, these were both true, but as Big Ag changed the landscape by, among other things, removing fair labor standards from the USDA requirements for organic certification, the message to the public was very cleverly controlled. In fact, if you read only industry communications on the slavery in cacao production issue, you would think that great strides have been made and it’s not something you need to worry about any more. But if you read the (very rare) investigative articles not controlled by corporations, you learn that nothing could be further from the truth. “Over two million children work in the cocoa fields of … Côte d’Ivoire [and other African countries]. These children are vulnerable to brutal labor practices, including trafficking and slavery. Candy companies—including but not limited to Nestlé, Hershey, Cargill, ADM and Barry Callebaut—have admitted accountability and promised to remedy this situation. Sadly, 14 years have passed since this agreement, and little has changed. The U.S. Department of Labor publishes an official list of products by country produced by adult forced labor, by child labor, or by forced child labor, i.e., WFCL. The most recent list, in 2017, lists cacao produced by child labor but not forced in Cameroon, Ghana, Guinea and Sierra Leone. It lists cacao produced by child slave labor in Cote d’Ivoire and Nigeria. Tulane University also does a survey of the WFCL situation in the cacao market every five years. Their last report, in 2015, stated that the number of children in WFCL had risen by 13% in the preceding five years. How then can you know that a chocolate product is fair trade? There are three primary third-party certifications to look for: Fairtrade, UTZ and Rainforest Alliance. In addition to third-party, there are various in-house fair-trade schemes. As all the problematic countries happen to be in western Africa, another assurance is if it is “single-origin” chocolate and the origin country is not African (in fact, there is almost no single-origin chocolate from anywhere in Africa). Unfortunately, there is not a strong culture of labeling chocolate (see organizing ideas below) so for things like cookies, ice cream, local bakeries, it may be necessary to do some research. I have done a small amount and have found three exemplary local concerns: Sweet Science Ice Cream, Totally Baked Vegan Donuts, and Dulceria Mexican bakery all use exclusively fair-trade chocolate. On the national market, Ben and Jerry’s Ice Cream is all fair trade. So this leaves a huge amount of fancy bakery goods and high-priced ice creams that are either not labeled, or, more likely, potentially contain WFCL chocolate. As I said, not all chocolate at the co-op, and not all organic products, are fair trade. A few exemplary brands at the co-op are Tony’s Chocolony, Tchao, Equal Exchange, Endangered Species, Divine, Dagoba, and Alter Eco. (There are others, but read the labels to find out.) Special note about chocolate syrup or sauce— there isn’t any fair trade. You have to make it yourself. Here is what I think needs to happen for us as consumers to have any impact. The main thing is, we need to speak up. Ask your co-op to commit to only selling fair trade. If that’s too much, ask them to shelve separately and label chocolate that is not fair trade, which will bring the issue to people’s attention. When it comes to their in-house bakery, encourage them to make it all fair trade. Ask them to include a class on the WFCL issue. If you belong to a faith community, start a discussion there. You could have a recurring fair-trade sale to raise consciousness if not money. (Equal Exchange has a program for that.) Again, at least ask people to label their own baked goods at potlucks and events so people know it’s fair trade. If you want to show a film, look for “The Dark Side of Chocolate.” Approach your favorite bakery, doughnut shop, ice creamery, restaurant or caterer and express your commitment to only buy fair trade. Ask them to stock and label fair-trade options, or to join you in that commitment. Among online resources, there are two main websites: /www.slavefreechocolate.org and www.freedomunited.org. 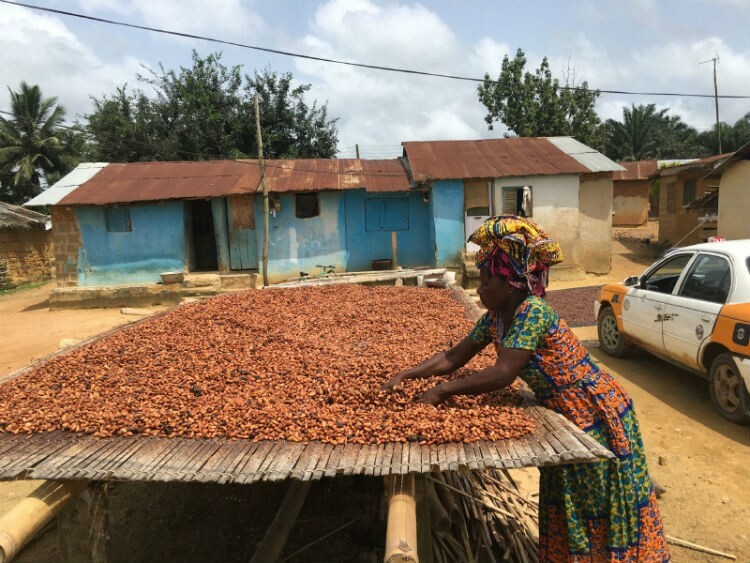 An industry journal article as recent as November 2018 at https://bit.ly/2qIKOv7 gives an excellent overview of where we are today and why fair-trade certification in these African countries is so difficult. Lastly, here is a handy checklist of chocolate brands: http://www.slavefreechocolate.org/ethical-chocolate-companies.